The Financial Crisis of 2007-2009 is now part of U.S. economic history. To document the worst financial crisis since the Great Depression, FRASER staff have captured the materials that agencies created in response to the financial crisis, as well as the Financial Crisis Timeline that the Federal Reserve Bank of St. Louis began in 2008. 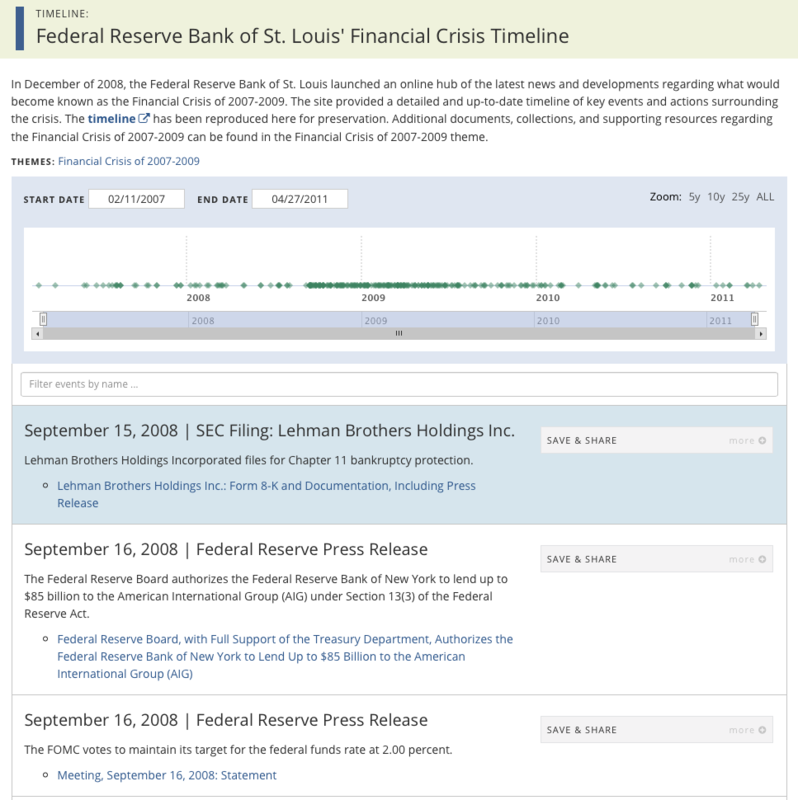 As soon as the scope of the crisis became clear, the St. Louis Fed began developing a Financial Crisis Timeline to track the latest news and developments. In December 2008, the timeline went online for the public. It tracked the events and documents from the financial crisis as they came out. In 2009, there were frequent updates—sometimes 10 or more in a month. In 2011, when the U.S. Senate issued the final report on the causes of the financial crisis, the St. Louis Fed ended the timeline. In all, 305 events were captured on the timeline, which links to original source documents. These documents are largely press releases and policy announcements from the agencies managing the crisis. Over time, as the agencies responsible for managing the financial crisis websites migrated to new platforms or updated content structures, it became clear that the documents and press releases linked to the financial crisis timeline were in danger of disappearing. Link rot was common, making it difficult to locate the documents St. Louis Fed staff had worked so hard to curate. FRASER staff were concerned that if we didn’t address the lost and missing documents from our timeline, the information would not be recoverable. This is not suggesting that the loss of documents was purposeful, because non-working web addresses and modified link content is common on the internet. The people who originated the documents weren’t necessarily thinking about preserving the historical record. To ensure the long-term preservation of both the source content and our financial crisis timeline, FRASER staff undertook a project to capture the timeline and its contents. Library staff checked the links for each document and for each, either captured the original or, if the document disappeared from its original location, searched for the document elsewhere on the Agency’s website or on sites like the Internet Archive. These materials are now all available in the Financial Crisis Timeline on FRASER. To supplement the materials captured for the timeline, we identified other government agency documents that were also generated in response to the financial crisis and assembled them in a Financial Crisis of 2007-2009 theme. This collection includes the TARP documents from the Treasury, the Federal Reserve Bank of New York financial crisis facility documents, and the many hearings held by Congress in response to the financial crisis. Not long before we were ready to post the new, enhanced financial crisis timeline and documents, the National Archives released the records, interviews, and other documents collected by the Financial Crisis Inquiry Commission. So, we added those as well. All together, these materials provide a comprehensive contemporaneous view of the financial crisis and the government’s response to it. The financial crisis continues to produce materials, but the work is winding down. The Treasury Department’s Office of Financial Stability continues to produce TARP reports and FRASER captures them for posterity. On September 18, 2018, more than 10 years after the start of the financial crisis, the New York Fed sold all remaining securities from the Maiden Lane LLC. With that action, the New York Fed no longer owned any assets from the three Maiden Lane facilities. The Maiden Lane facilities were created in 2008 as part of the Federal Reserve System’s response to the financial crisis, specifically to facilitate the merger of Bear Stearns and JP Morgan Chase and then alleviate capital and liquidity pressures on American International Group Inc. (AIG). It can be difficult to remember, 10 years later, how quickly the economy deteriorated. Looking back over the timeline, it is astonishing how many things happened in late 2008 and early 2009. The pace of events and responses was incredibly fast. The timeline captures the number of events and their speed as well as their order of occurrence. And, of course, it also effectively captures the policy responses to those events. These primary source documents from the time the events happened will continue to be resources for researchers and other interested parties.